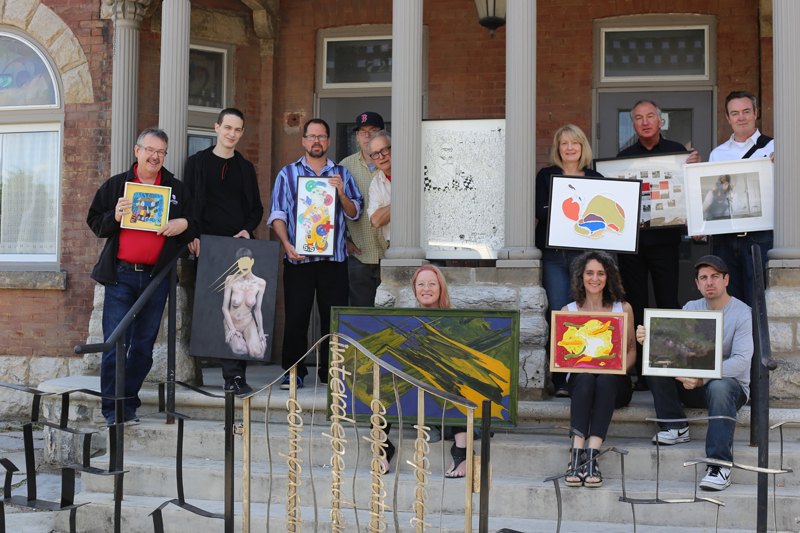 Sponsors and Artists gathered for a sneak peek at UPwithART’s 5th Anniversary offerings on June 2nd and then for a photo… Jim Wilkes/Unifor Local 27, Adam Giroux, Aidan Urquhart, Geoffrey Hume, Wyn Geleynse, Kim Wilkie, Brian Meehan/Museum London, Rob Nelson (standing) and Monica Lindenfield, Silvia Langer/Unity Project, Trevor McNaughton/UP+Artist (seated) gathered for a sneak peek at UPwithART’s 5th Anniversary offerings. Good conversation inspired by great art in the packed livingroom – art filled every corner – of Unity Project’s transitional housing building. Unity Project shares a love of art and community with its generous sponsors including Presenting Sponsor Mitchell & Kathryn Baran Family Foundation; Media Sponsor CTV London; Gold Gallery Sponsors Callon Dietz and Unifor Local 27; Silver Stage Sponsors Manu Panwar DDS & John Demarco DDS and Harrison Pensa; Bronze Art Sponsors The Good Foundation, LBF Media Group, Museum London, Framing and Art Centre (downtown), Colour by Schubert, McIntosh Gallery, Sweet Magic London, The Root Cellar, North Moore Catering, The Grand Theatre. Their support and high bidders will help Unity Project reach its 5th Anniversary goal to raise $75,000 for relief of homelessness in London.